Kitty Kraft has evolved from Emma’s love of Arts and Craft. Starting by designing and creating bespoke greeting cards. She was persuaded by some of her associates to take the giant leap to start her own business. 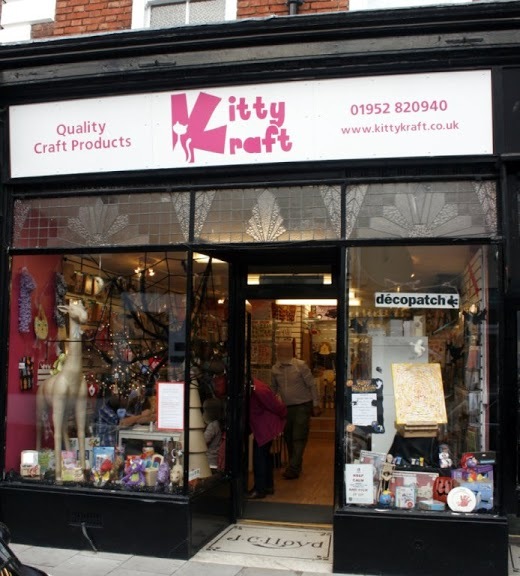 Kitty Kraft has now been established on St. Marys Street, Newport, Shropshire, with the concept of unique creativeness nothing is recreated and no two items will be the same as each is individually and lovingly created by hand. To project her enthusiasm for individuality, parties and workshops are organised to show the doubters young and old that everyone is able to create, unique ,desirable art based items by using their own imagination. Successful results have been achieved by visitors from 4 to 79 years old. Emma’s love of creating is her driving force and is constantly upgrading her products and techniques. If you want to organise a creative party, Kitty Kraft is the place to call. We look forward to hearing from you and welcoming you into the shop on St. Marys Street where you can meet Hetty the Elephant, always a hit with the young and old alike.